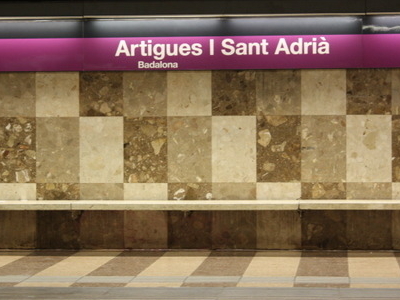 Artigues | Sant Adrià is a Barcelona Metro station in Badalona, named after the neighbourhood of the same name. In spite of what the latter part of the name suggests, it's not located in Sant Adrià del Besòs and the tag Badalona was added to all signalisation in the station in order to avoid confusion. It's served by L2 (purple line). It was opened in 1985 by the name Joan XXIII as part of L4 and became a L2 station in 2002. It can be accessed from Carretera de Santa Coloma and from Avinguda de Joan XXIII. Here's the our members favorite photos of "Metro Stations in Barcelona". Upload your photo of Artigues - Sant Adrià!